We just got back from a trip to Morocco. 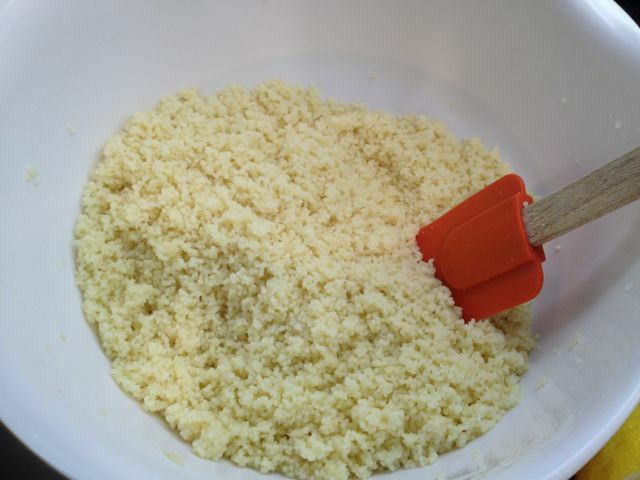 I fell in love… with couscous! I made some today and it turned out really good. 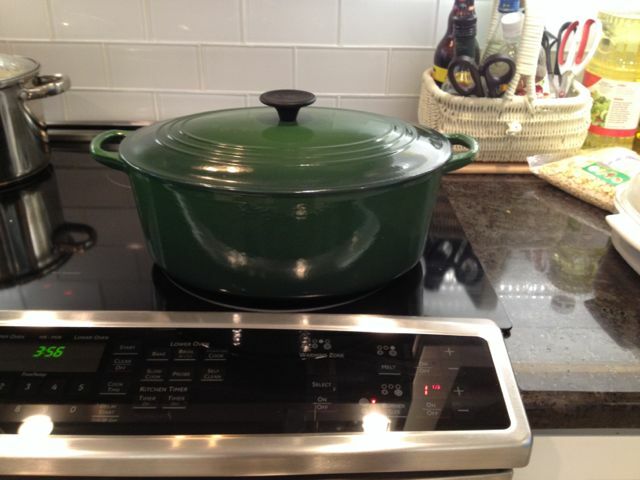 I used a large dutch oven but you can use any large pot so long as it heats evenly because this dish is cooked on very low heat. After I heated the pot on high I turned it down to 2 for the chicken and 1 1/2 for the vegetables. 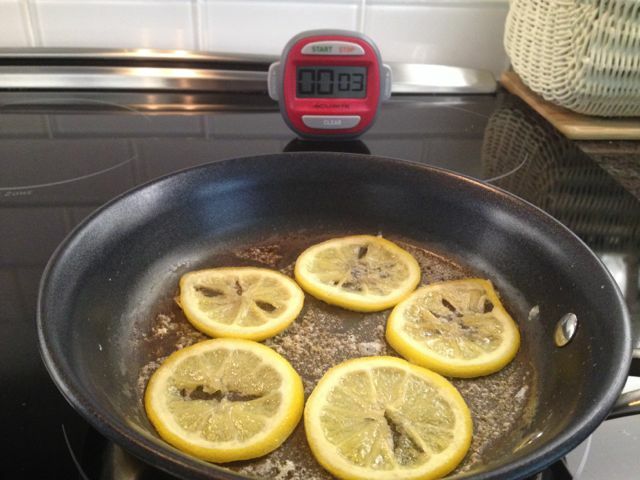 I prefer to cook slowly on low heat when I use olive oil which tends to burn easily. 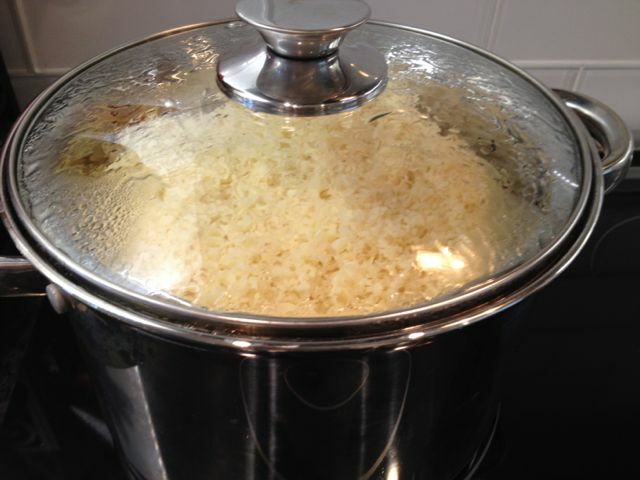 Sweat the onions in 2 tbsp olive oil on low heat. 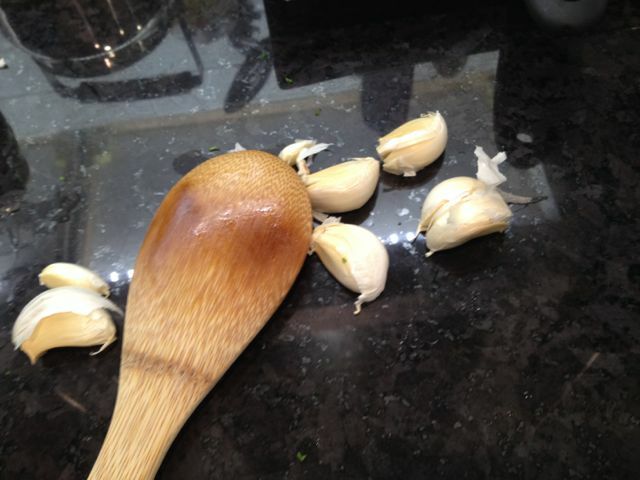 I use a wooden spoon to smash the garlic pods. That way they don’t go flying around the kitchen. 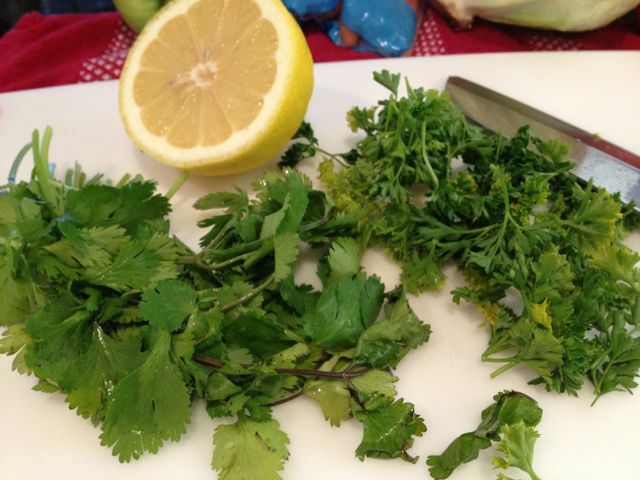 Wash the cilantro and parsley, remove sticks, and cut the large lemon in half. 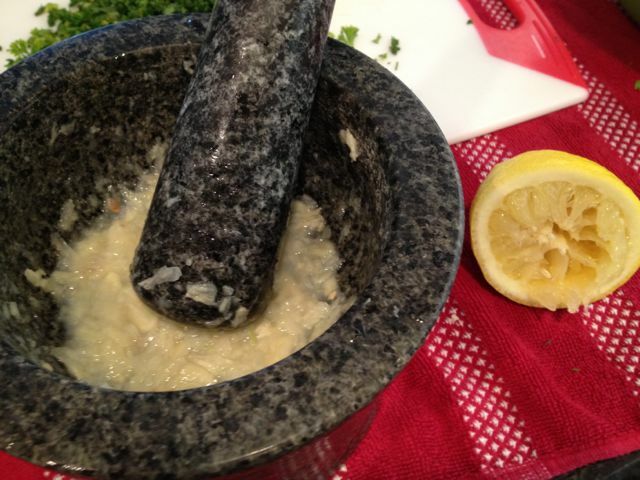 I don’t have a garlic press but I have a mortar and pestle. Either is fine. 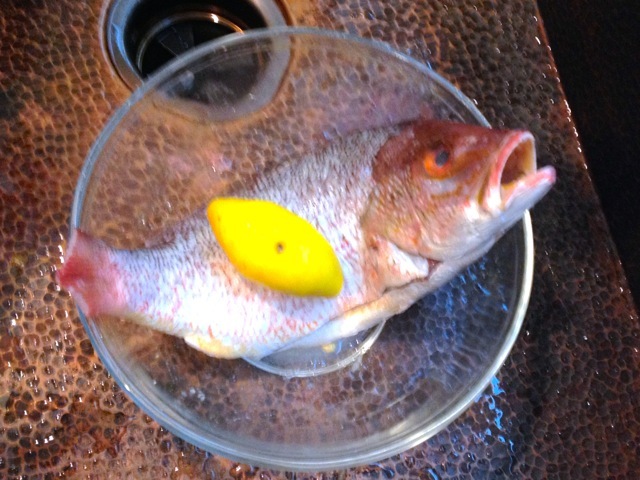 I add lemon juice in the mortar after the garlic is mashed up. 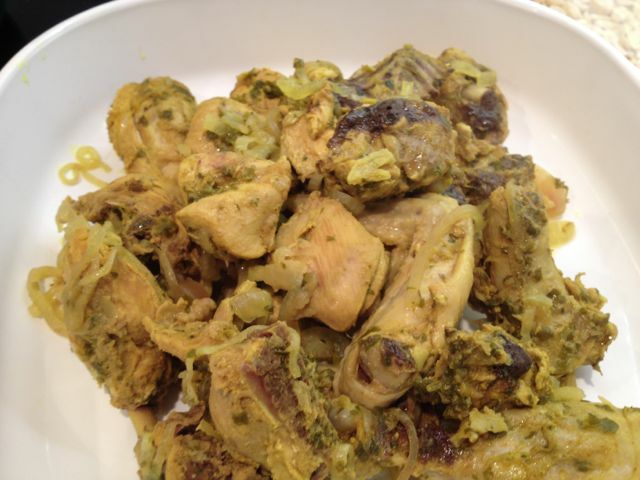 Mix the garlic, lemon, turmeric, ginger powder, cumin, and salt. Rub into the chicken and let it sit for a few minutes. 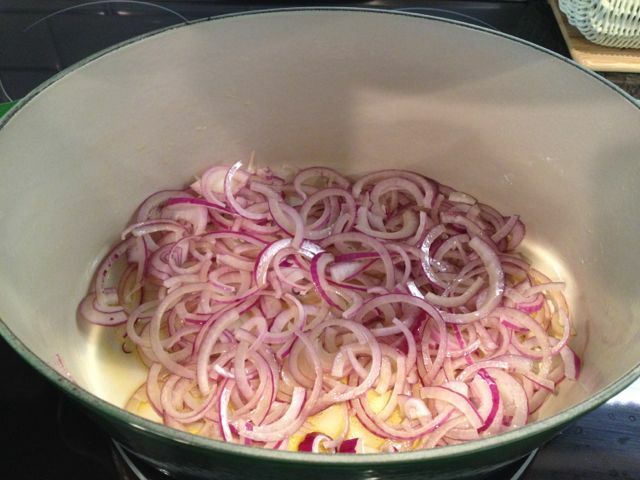 Add chicken to the now softened onions. Stir to get the chicken coated nicely with the oil and onions. Add enough water to cover the chicken. 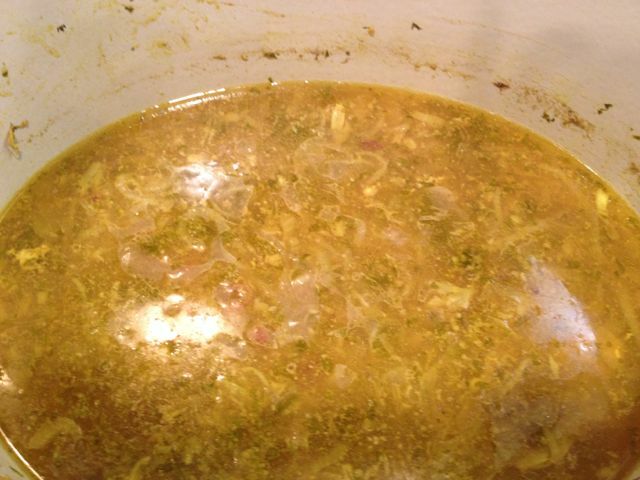 Cover and simmer on low heat until meat is tender. 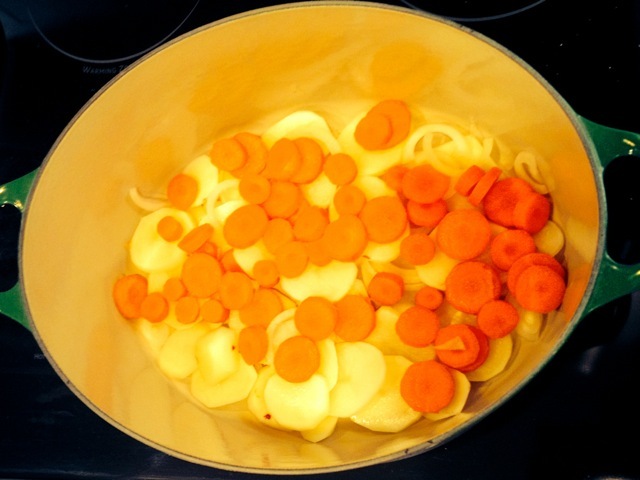 Wash and peel vegetables (scrape the carrots). 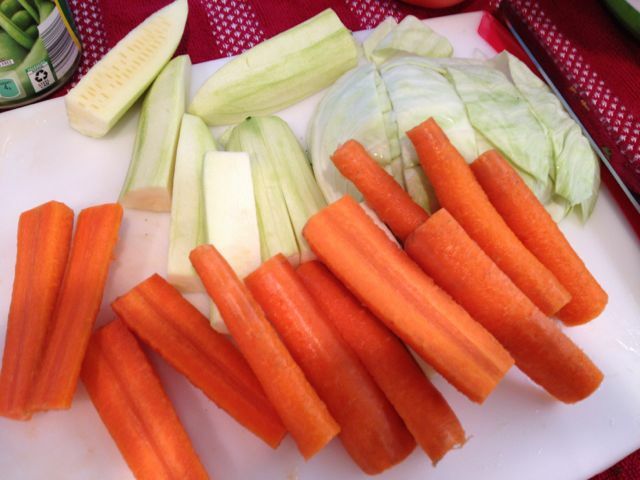 Traditionally the vegetables are cut in half lengthwise but I cut them smaller. 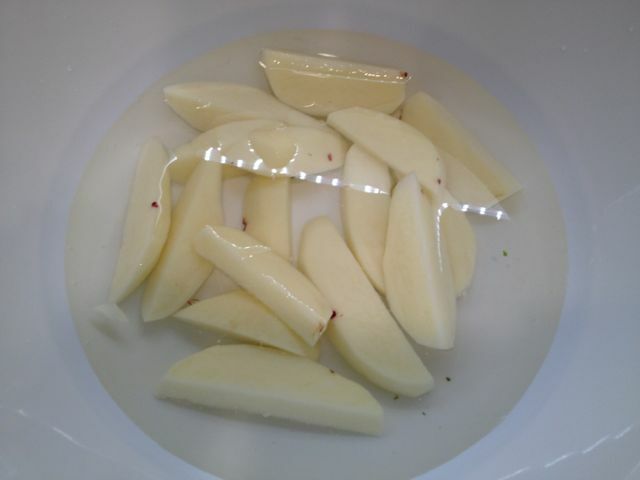 Once cut, potatoes should be kept in salt water or else they oxidize. 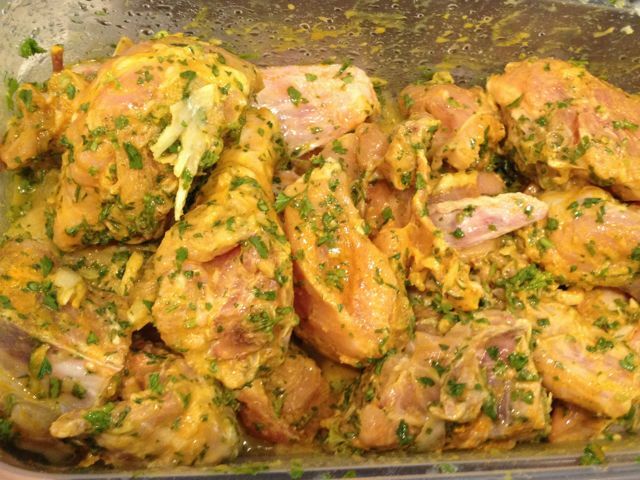 Remove the cooked chicken from the sauce and put aside. 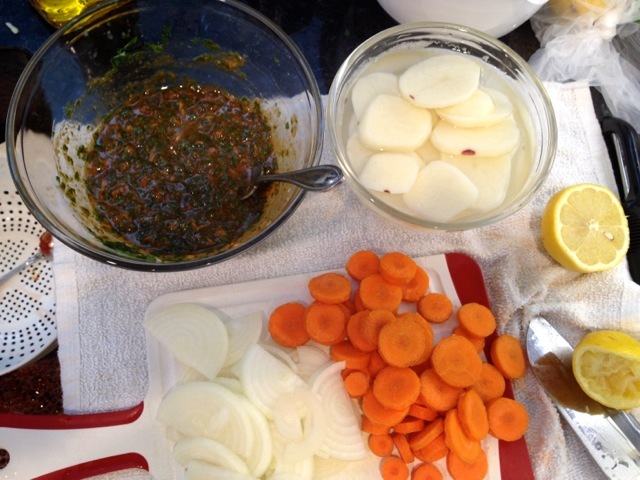 The broth will be used for cooking the vegetables and then served with the couscous. 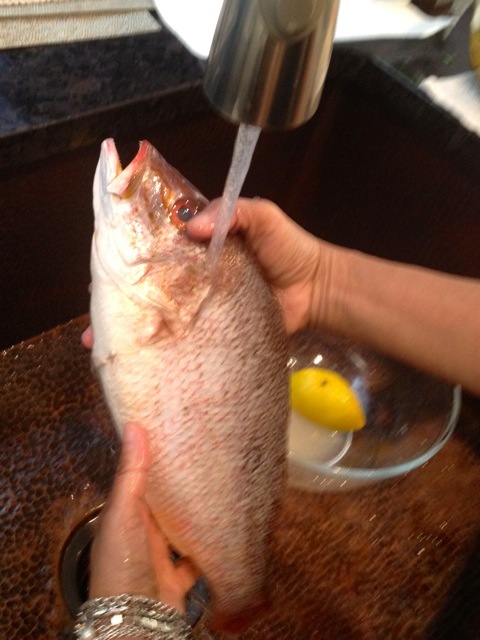 Soak the couscous in water (I add about an inch over the top of the couscous. 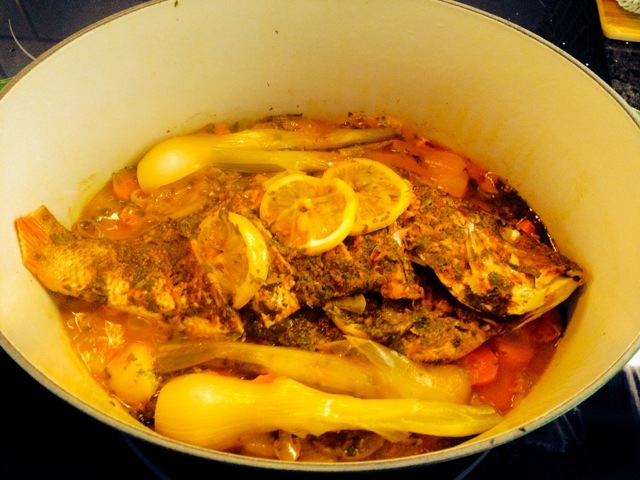 Leave for a few minutes and then fluff with a fork and add the remaining 1 tbsp of olive oil. 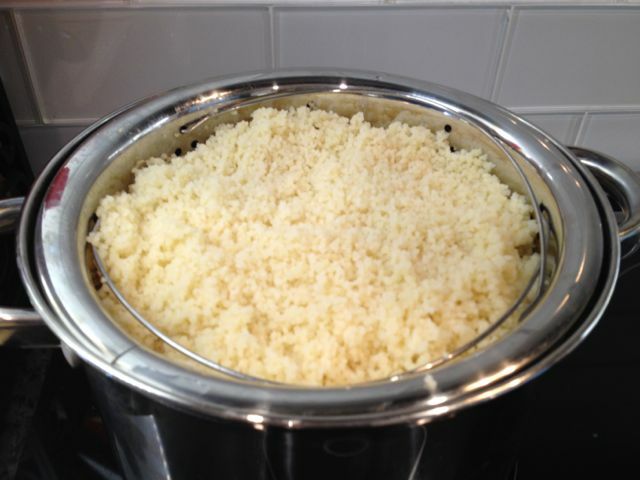 Steam the couscous for 10 minutes, return to bowl, fluff with a fork, add more water and leave to absorb. 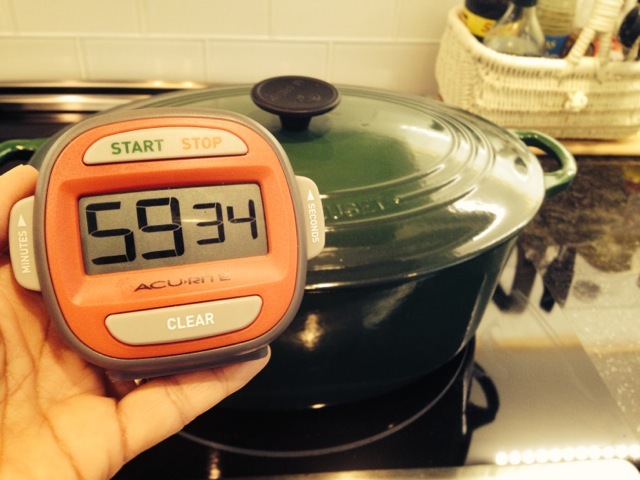 Then steam again for 25 minutes. 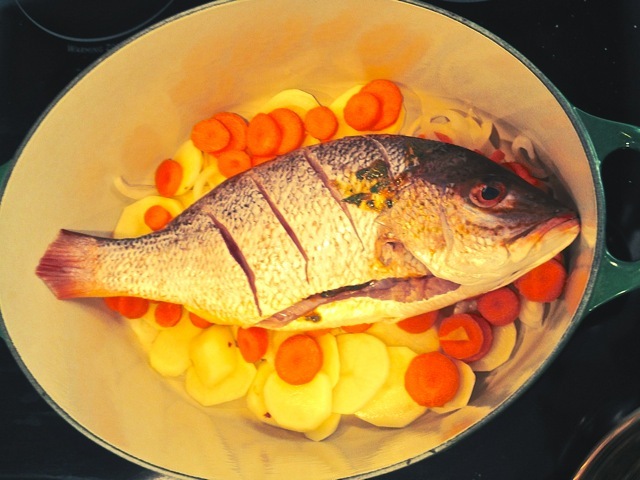 Repeat the last step and steam another 10 minutes if you like the couscous more tender. 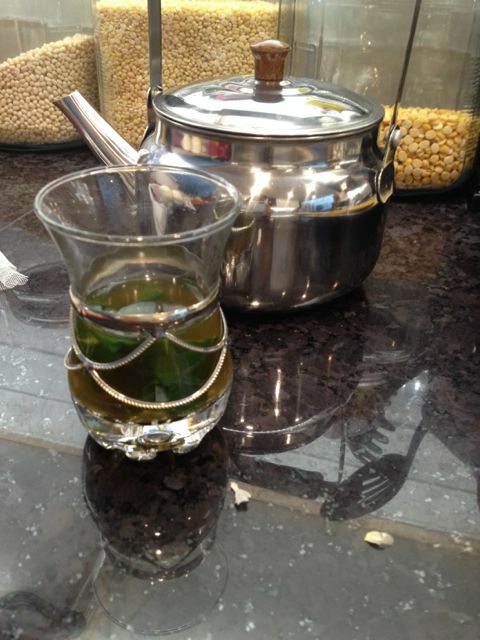 While you wait… you may as well prepare a cup of Moroccan tea for yourself. I use a tsp of green tea (per tea glass) in a small teapot. and after a minute remove one glass of tea and put aside. Add more water to the pot, swish it around (to wash the tea) and pour it out and discard. 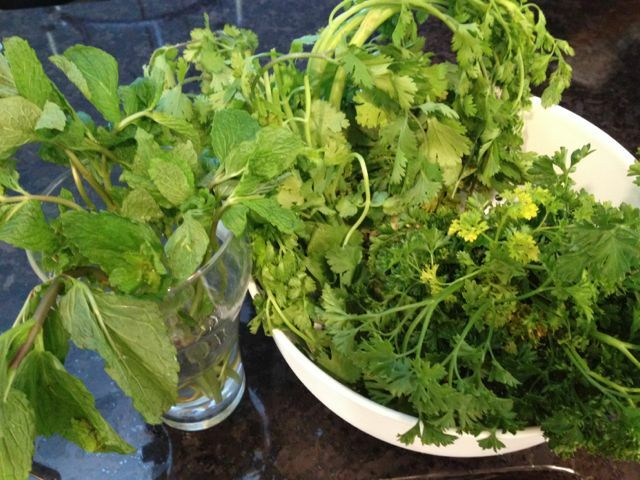 Put more hot water into the pot, add sugar, the first glass of tea and fresh mint to the teapot. Before pouring add fresh mint to the cup/glass too. 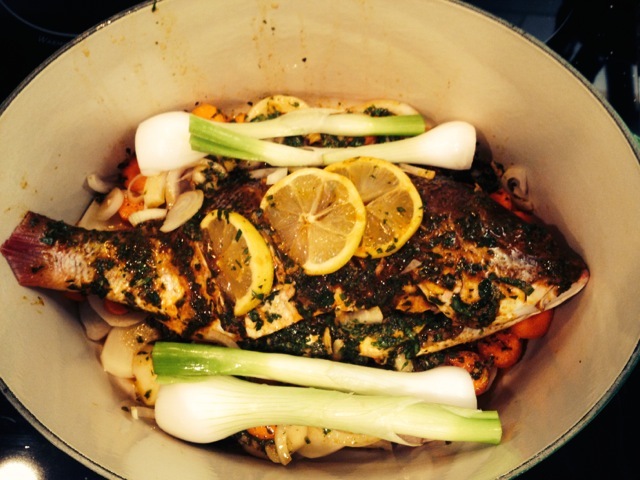 With tea in hand… back to the business of couscous. 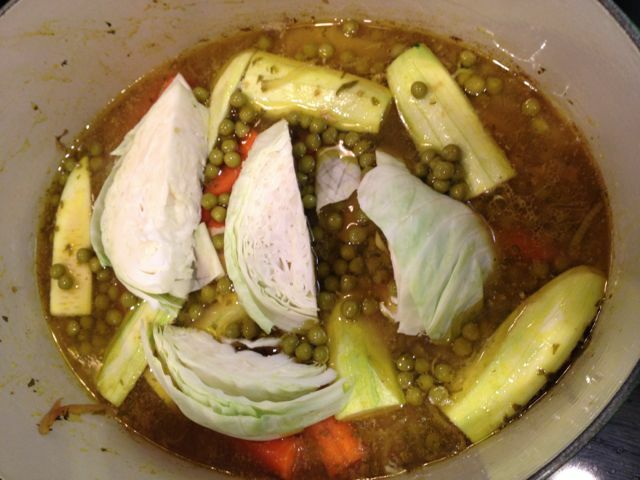 Add vegetables to the broth in layers. First potatoes, then carrots, then zucchini, then cabbage and peas. Do not stir. 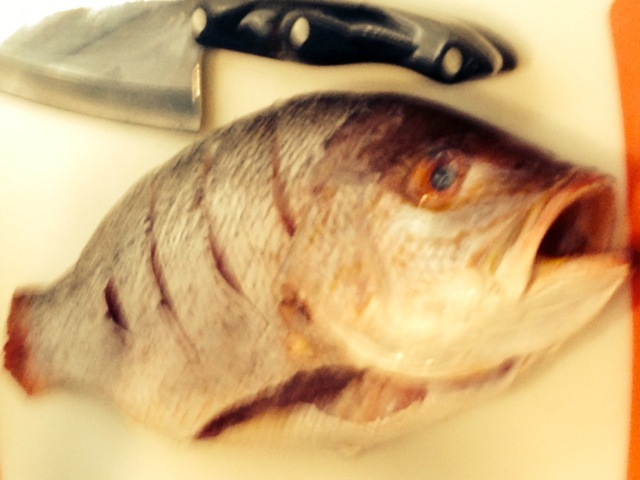 Cook on low heat until tender. A few minutes before they are done, add olives to the mix. 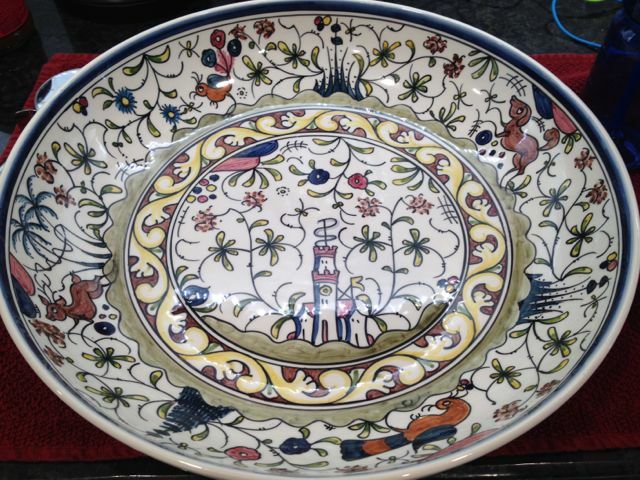 I don’t have a large round tray so I used my pasta bowl. 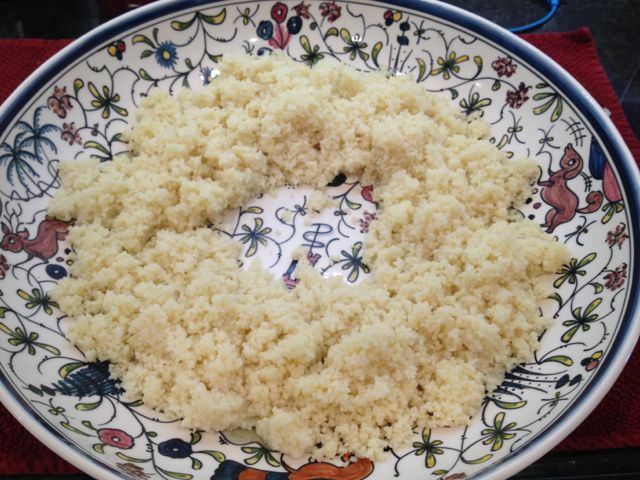 Arrange the couscous in a ring. I really needed more couscous and will have to make 3 cups next time. 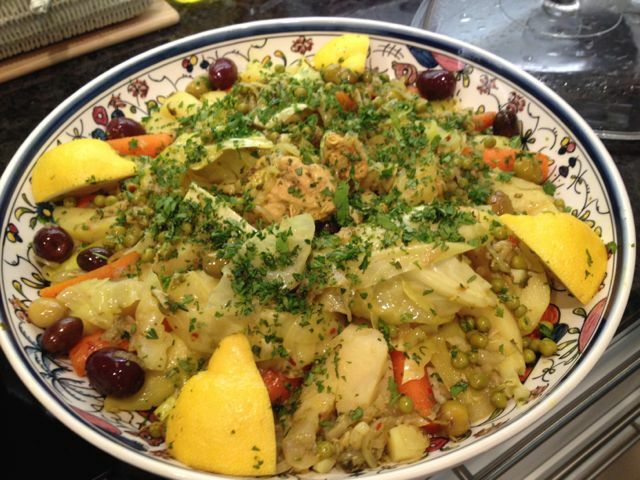 Add the chicken to the center and arrange the vegetables around it on top of the couscous. 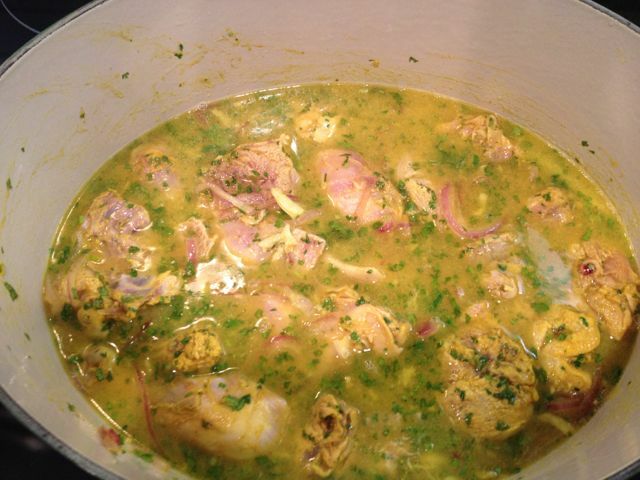 Add the remaining lemon and chopped cilantro and parsley on top. 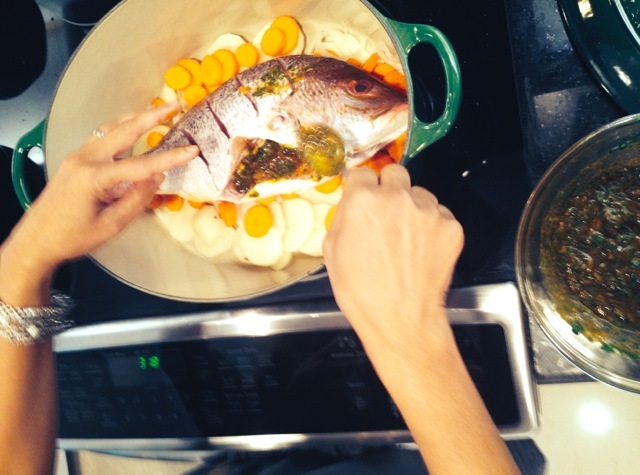 Serve the broth on the side to be ladled over the couscous. I don’t use a lot of salt when I cook. 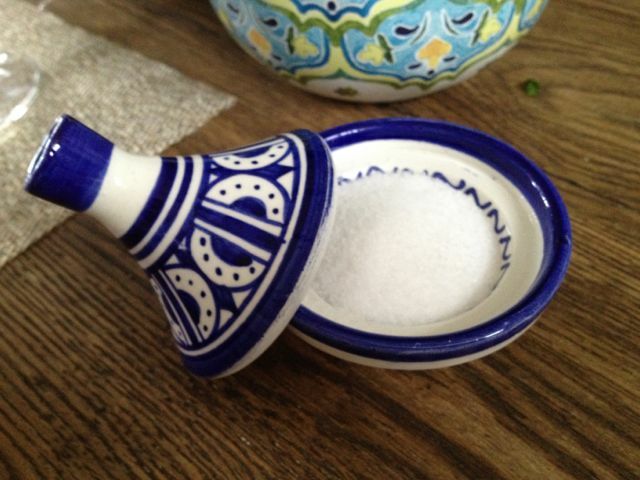 There’s always some sea salt on the table for those who like more.